The Portland Trail Blazers are second in the league in free-throw percentage behind the Oklahoma City Thunder. Their clutch shooting ability from the line translated into wins this week. In Tuesday’s 106-99 win over the Suns, the Blaze went a remarkable 32 of 33 from the foul line, finishing with 17 straight freebies in the fourth quarter. LaMarcus Aldridge sank 10 consecutive free throws in the game while Roy went 9 for 9. Miller was sidelined against the Suns due to a one-game suspension following an altercation with Blake Griffin. But he was on a roll from the line prior to the miss, knocking down over 30 consecutive free throws, 9 of which helped cement a win over the Clips to snap a 6-game losing streak. Miller doesn’t get to the line quite as often as Roy and Aldridge, but when he does he hits the mark. 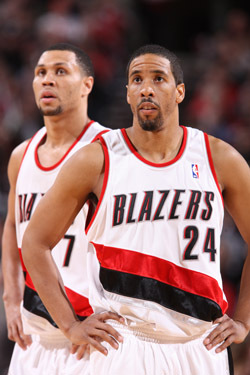 Ranked 9th and 10th overall respectively, guards Brandon Roy and Andre Miller lead their team in FT%. All three guys will get a chance to hit some more foul shots tonight when they host the Magic at the Rose Garden. Will Miller be able to keep his streak alive? Who will finish the season with the highest FT% – Miller or Roy?